Turmeric is an amazing spice that has been used for medicinal and beauty purposes over many centuries. While you may be most familiar with the bright yellow spice from Indian, Southeast Asian, and Middle Eastern curry dishes, it's also an excellent skincare product. As a face mask, turmeric can heal and beautify your skin and it's easy to do at home. When combined with yogurt or coconut or olive oil, turmeric will add a brilliant glow to the skin. It also has potent anti-inflammatory and antioxidant properties that can help fight acne and wrinkles. Indian women have long used turmeric as a skin brightener. It's common practice for Indian brides (and their grooms) to smear a turmeric paste made of the powder and sunflower oil on their skin to brighten their complexions for the wedding. Turmeric is also popular among African American women. Actress Thandie Newton (who is a light-skinned black woman) reportedly adds turmeric powder to her tinted moisturizer to give her the perfect glow. Turmeric powder may be used to brighten skin tone, but it's main ingredient, curcumin, works to suppress excess melanin production caused by sunlight. This is another reason why women with darker skin love it. Women of all skin types—from oily to dry—can benefit from turmeric's 300 antioxidant and it's antibacterial properties. Curcumin helps treat chronic inflammation, skin irritations, and sun damage—all of which can cause premature aging. Vitamin B6 and magnesium are present as well, and these help with new skin cell growth. Turmeric also contains vitamin C, which helps keep skin soft and firm as well. If you have dry skin, redness, wrinkles, or dark circles under your eyes, the turmeric mask can be quite helpful. Additionally, turmeric is a popular home remedy for eczema and psoriasis. When it comes to healing acne, the turmeric mask can unclog pores while reducing oils on the skin. It can be used to treat breakouts or become part of a regimen designed to prevent pimples in the first place. There are a couple precautions for using a turmeric mask and both have to do with the color. 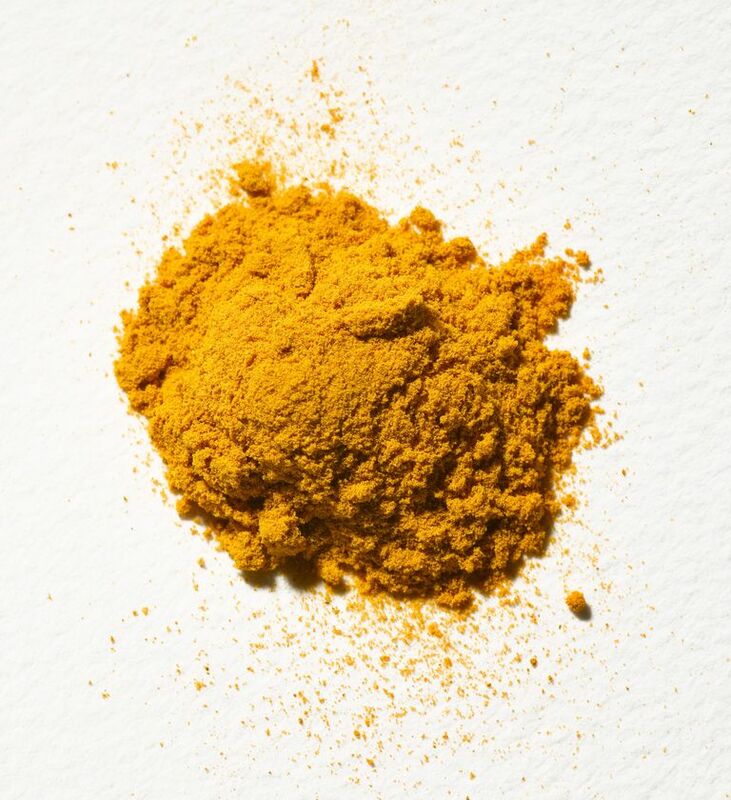 Not only is turmeric responsible for making many curries yellow, it's also a natural fabric dye. This means that there is potential it may temporarily discolor skin or permanently stain clothing. Fair skin is more susceptible to staining. The same properties that make yellow and dark skin glow can make pink-skinned women look sallow. However, the stain does fade away after a few hours and the after-effects are usually worth it. If you're concerned about your lighter complexion, you can do a spot test on a hidden part of your skin or try this mask at night the first time. After washing your face in the morning, you should see the glow without the yellow color. Also, when you're applying this mask, be sure to protect your clothing from spills or drips. You can either wear a shirt you're not concerned about or drape a towel over your shoulders. If the mask does drip on fabric, it is possible, though difficult, to remove the stain. However, it's not a guarantee that it won't produce a faint yellow spot. With that in mind, the washcloth you use after the mask will turn yellow. Be sure to choose one that you don't mind staining. The basic recipe for a homemade turmeric face mask is simple and it's likely that you have most of the ingredients already. There are a few options, so feel free to experiment to see if, for instance, you like coconut oil more than the almond or olive alternatives. While any honey will do, consider using manuka honey. Originally from New Zealand, this type of honey is harvested from the tea tree plant and it offers its own healing benefits. It is anti-bacterial, anti-inflammatory, anti-fungal, and has many antioxidants, making it good for healing acne and reducing redness. Paired with turmeric, you can get the most of this mask. If you have dry skin, add the oil slowly and stir until a paste is formed. Add more if you would like it creamier. Apply the mask to your face and neck. Leave the mask on for 15 to 20 minutes. Using a warm, wet washcloth, rinse off the mask.